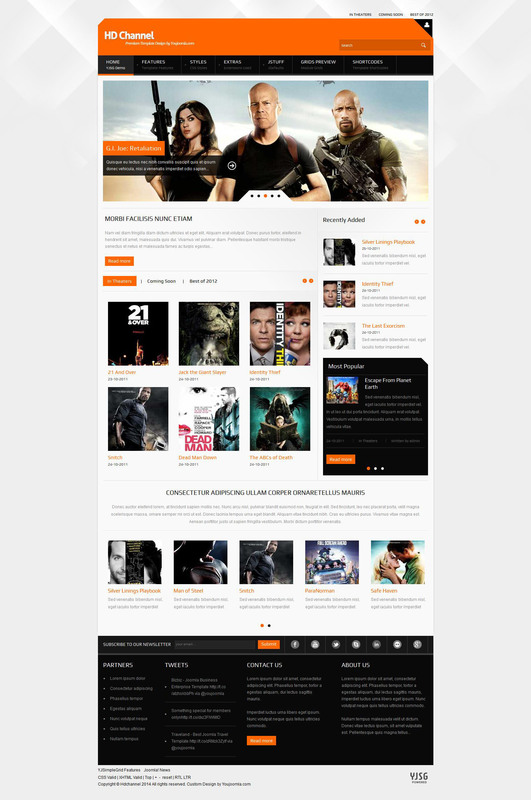 YJ HD Channel - an excellent template for the multimedia portal sites running CMS Joomla 2.5, designed by professional designer studio YouJoomla. Original design template includes 4 color schemes that are easily configured through the control panel in the administrative part. Through the use of functional platform Rock Solid Framework, the template has adaptive functions that provide correct display on any screen mobile devices. In the installation package includes the best club extensions: YJ Pop Login, YJ Multitabs, YJ Live Search, YJ Image Slider, YJ Latest Tweets and Youyork Module Slider, which provide a template with all necessary functions for flexible display. Integrated support for K2 component allows a convenient way to create and manage the contents of the site. YJ HD Channel - a great solution for creating portals offering download movies, music or theater online projects.